Author Saphirre Long. Photo by Joel Calixto. A rush of emotions swept over me as I sat in my Mexican-Americans in Schools class. Empowerment, anger, gratitude, and frustration fluctuated within me like I never felt before. My professor was discussing the contemporary circumstances of Xicanx/Latinx students in public education, and it struck me that it was the first time I was hearing a lecture related to my personal experiences, as well as my identity, the part of my identity that has been suppressed. Ironically, we have been taught to believe that school is where we receive an education, and that obtaining knowledge and learning occurs in the classroom. However, my exposure to Xicanx Studies during my first year at UCLA has been the opposite. I have begun the process of unlearning all that I have been taught in an academic setting, and I have come to realize that the American education system is not about education at all, but the miseducation of many Xicanx/Latinx students. Although I cannot speak for all students who have been a part of Xicanx Studies classrooms, it has become more evident that other Xicanx/Latinx students have a similar experience to my own. Prior to being at UCLA, I was not exposed to Xicanx Studies. With the ability to critically reflect on this now, I understand that this was no accident. I feel excitement and empowerment in being able to dedicate my studies to deconstructing and raising critical consciousness. However, it does not erase the trauma and injustice I have faced, and to an extent have internalized in my education. It has never been as emotional as it is now to sit in a classroom, because for starters, I am barely learning about events in Xicanx/Latinx history that I had the right to know about years ago. Secondly, learning to use my voice is a challenge when our community has been intentionally silenced, especially in the classroom. On the other hand, acknowledging my emotions and experiences is crucial in my healing process, and to become empowered in an institution that was not built for me. The introduction I have had in Xicanx Studies has transformed my life in only a few months, and it is one of the most important spaces I will ever be a part of. I could have never imagined that I would have the opportunity to critically analyze or reflect on my personal experiences, and to do so with other Xicanx/Latinx students as a community is liberating. 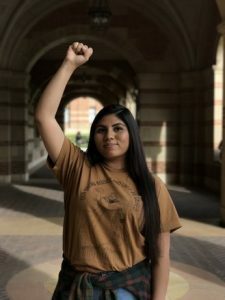 While our community faces systemic barriers and oppression outside of these classrooms, continuing to pursue Xicanx Studies in higher education in itself is an act of resistance. My perception of fulfillment is being able to transform my own narrative of injustice into purpose, in hopes that it can relate to others, and to assist in the spark I wish I would have had sooner. Xicanx Studies has taught me that for as long as I am disconnected with my history, that I will also be disconnected with myself. Although the process of unlearning and transforming my miseducation is personally challenging, the beauty in the revolution of consciousness overpowers all. This course of digging deep within myself, to discover what has been buried by colonization and capitalism will be a lifelong progression. My resistance and healing has begun in Xicanx Studies, and I realize now that it is much bigger than myself, but healing and resistance is also for my family and my community. To embrace my identity and narrative from the Xicanx Studies space is also the cultivation of a sacred seed from the roots that is my lineage.